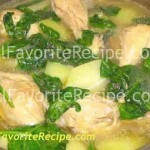 This is another Filipino dish famous for the variety of ingredients. Shrimp is often used as the main ingredient, but fish, pork, beef and almost anything can be used to make this delicious soup. The sinigang’s characteristic taste is attributed to the ingredient that gives its sour taste and the commonly use ingredient is comes from the tamarind (sampalok), but this can also be made with guavas, unripe tomatoes, calamansi (Philippine limes) or pineapples. This is best served during cold Canadian weather. 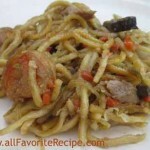 It can be also meant for scorching summer days, as the sour taste awakens the taste buds and stimulates the appetite. Boil the shelled tamarind in a saucepan with 4 cups of the water for about 20 minutes, or until soft. The tamarind has to be submerged. Add more water if necessary. Use fine-mesh strainer to strain the mixture into a bowl. Mashing the pulp with the back of a spoon to force it through the strainer. Discard the pulp and seeds. Set aside the tamarind liquid. Pour the remaining 8 cups of water into a stockpot and bring to boil. Add the garlic, ginger, radish, taro root (or potato, if using) and tamarind liquid (or the tamarind concentrate or the sinigang powder). Cook over medium heat for 15 minutes. Add the okra, tomato, shrimp, cabbage, salt and 5 tablespoons fish sauce; cook for 15 minutes, or until shrimp is done. Serve hot with steamed rice and fish sauce, if using.